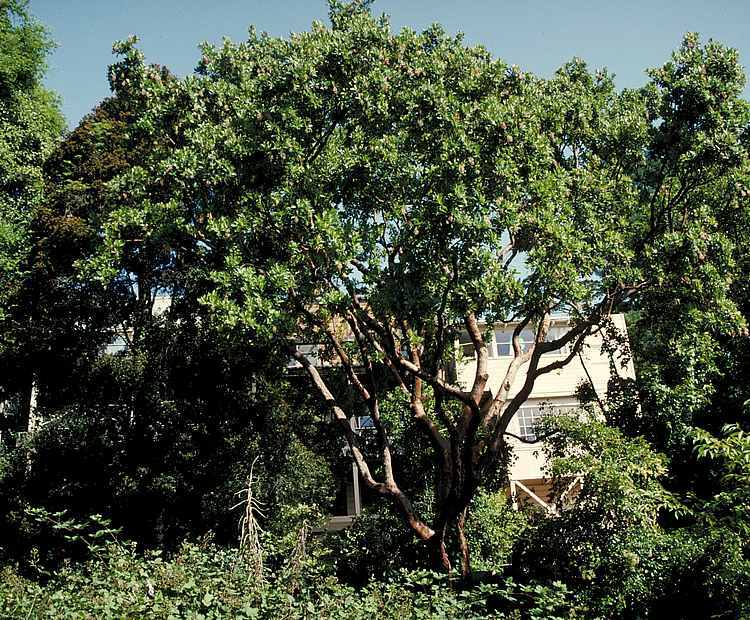 Victor and Carla Reiter's Arbutus 'Marina' was planted in their garden in 1944. Arbutus 'Marina' is a large tree, growing to 50 ft. tall with a broad dense crown. The upright branches are covered with a smooth mahogony colored bark which exfoliates in late summer to expose the next years bark, which at this stage.is a cinnamon color. The dark green leathery leaves of Arbutus . Marina. are 4-5 inches long with the flushes of bronze colored new growth from spring through summer which adds interest and lightens the look of the tree. The pendulous clusters of urn-shaped white blushed pink flowers are produced year-round along the coast with peaks in spring and fall. The fruit that follows also appears heaviest in spring and fall in such a manner that the younger yellow fruit are visible while mature red fruit is still on the tree. This adds further to the decorative qualities of this tree as it almost appears as though the tree has Christmas decorations upon it. The fruit is also edible with a flavor likened to a mixture of kiwi fruit and strawberry but as with the fruit of the common strawberry tree, Arbutus unedo, the texture is gritty. How Arbutus 'Marina' made its way into cultivation is a curious story. Though many people have appreciated this tree for better than half a century it wasn't named and introduced into the general nursery trade by the Saratoga Horticultural Foundation until 1984. The Saratoga Horticultural Foundation had taken cuttings from the tree pictured above that was growing in the late Victor and Carla Reiter's garden, on Stanyan Street in San Francisco, where it had been planted in 1944. Mr. Reiter had acquired his plant in 1933 when he was allowed to take vegetative cuttings from a boxed specimen that was at the Strybing Arboretum. The Strybing Arboretum, under director Eric Walther, had purchased the boxed tree from the closing down sale of Western Nursery on Lombard Street in the Marina District. Charles Abrahams, the owner of Western Nursery, was thought to have taken cuttings from trees that were sent from Europe for a horticultural display at the 1915 Pan Pacific International Exposition, one of which was probably this beautiful tree. We have seen many interesting stories and claims about the origins of this tree. The information on this page comes from our own observations and from the Arbutus 'Marina' Plant Data Culture Sheet that the Saratoga Horticultural Foundation published when they introduced this tree in 1984. Sadly, as noted in Michael Sullivan's The Trees of San Francisco (2013), the historic and beautiful specimen tree in the Reiter garden began to fall over and was cut down in 2006. Sullivan also noted that this tree "was the generic parent of the nursery stock now sold all over California". San Marcos Growers planted a Arbutus 'Marina' in its nursery gardens in 1989. This tree now graces the nursery's main demonstration garden, having grown rapidly since its planting and was officially measured on July 24 2013 for inclusion on the California Big Tree Registry at 44 feet 10 inches tall with an average crown spread of 53 feet 5 inches wide and a trunk circumference of 108". We encourage our customers who visit the nursery to take the time to visit this garden and admire this beautiful tree. It is not clear what the parentage of Arbutus 'Marina' is, although there is speculation that it is either a very good selection of Arbutus x andracnoides or a hybrid between A. x andrachnoides and A. canariensis. To further add confusion it should be noted that A. x andrachnoides is itself a naturally occurring hybrid of A. unedo crossed with A andrachne and A. canariensis is considered by many to be an insular form of A. unedo. We have also seen this plant listed as Arbutus glandulosa 'Marina, which is particularly interesting as this is a central American species. In the initial release of Arbutus 'Marina' the Saratoga Horticultural Foundation noted that the tree was a fairly pest free and disease resistant; we in fact started calling it the garden tolerant Madrone. Through years of growing and gardening with Arbutus 'Marina' we have discovered that it in fact has a few pests that feed upon it and a few diseases that can cause it harm. The new growth is occasionally attacked by aphids, which will cause the associated sooty mold. Ant control seems to be the best preventative for this. On occasion we also see Greenhouse thrip, soft scale and Glassy Winged Sharpshooter. For these pests, the pest preasure on our garden plants have never reached a threshold that required us to treat with a pesticide. We treat our nursery plants as necessary to assure that they are pest free. For many years we thought that Arbutus 'Marina' was resistant to plant diseases but in conditions that promote the disease we have found that Arbutus 'Marina' is susceptible to at least 2 plant pathogens. Phytophthora root rot is the most serious of these diseases but when planted correctly in well drained soils and not over irrigated, this disease has not appeared to be a problem. In most cases we have seen this problem when the tree is being overwatered or has been planted too deep or in compacted soil. Unfortunately this disease seems to eventually kill the infected plant. We have also seen several established trees losing lower leaves and small twigs inside the canopy. A laboratory analysis has proved this to be caused by the fungus Botryosphaeria. This fungus is opportunist in nature and usually only attacks plants that are under environmental stress of some form. A tree infected with Botryosphaeria may appear vigorous and healthy at its growth tips yet have twig die out within the canopy. The information for controlling this disease on ornamentals is limited but the general consensus is to reduce the stress to the plant and avoid wounding the plant unnecessarily. When pruning infected branches, do so well below all discolored wood and dispose of dead plant material. Clean pruning tools between cuts with a dilute solution of household bleach (1 part bleach to 9 parts water). There are fungicides registered for Botryosphaeria: consult a certified pesticide advisor for application recommendations. See the tree in our garden!